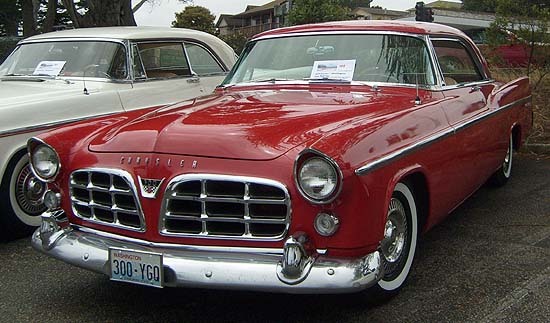 The success of the original 1955 C-300 inspired Chrysler Division to try again, so an improved version, the C-300B, was scheduled for the 1956 model year. Contrary to many accounts, the C-300B was not an Imperial derivative. The basic body was the same as the C-71 Windsor, with different holes drilled in the body in white (before paint) stage. The only Imperial parts were the front panel that held the grilles, and the grilles themselves. The hood was common with all series, but was listed as Imperial since it was not drilled for the eagle ornament used on the Windsor and New Yorker series. 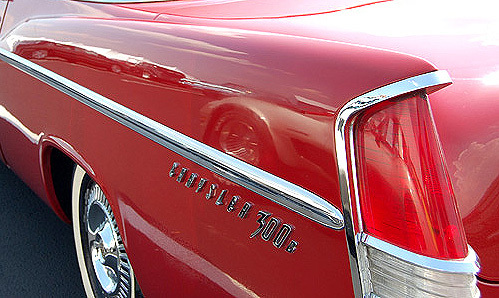 Wheel covers were Imperial with a 300 plastic emblem substituted for the Imperial emblem. The running gear was basically New Yorker. As far as can be determined, only the race cars ever received the larger spindles, bearings, rear axles, etc which were standard on Imperials and Chrysler wagons. The C-300B interior was the same design as the C-71 Windsor except the seats were built over the C-72 New Yorker patterns. Of course, special colors were used on the dash, steering wheel, door and quarter interior trim panels, etc. To save money, a few of the genuine leather seat panels used in 1955 were replaced with vinyl in 1956, but basically the interior was unchanged from 1955. Engine changes included a switch to hardened crankshafts, malleable iron main bearing caps and tri-metal bearings, all standard truck items. These were running changes during 1955 and no serial number records exist. Displacement was increased to 354 cubic inches, the production camshaft was altered slightly (1955 part number 1635736; 1956 part number 1637518), and the compression ratio was increased from 8.5:1 to 9.0:1 resulting in 340 HP. With optional 10.0:1 heads, 355 HP was available, the only 300 engine to ever achieve more than one horsepower per cubic inch. 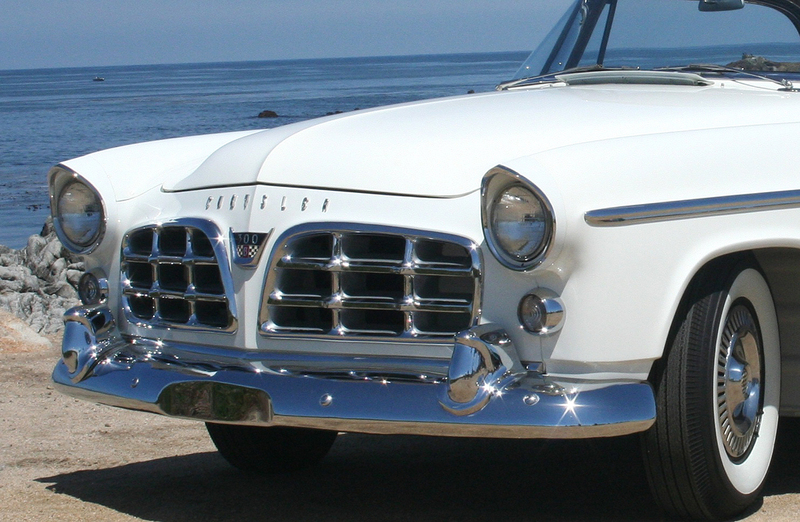 Sales for all models were slow in 1956 and a great push was put on to close out accessory stocks in the spring. Many cars were equipped with wire wheels and record players, as these parts would not fit the 1957’s. Some late Imperials and 300’s were also equipped with the new Torqueflite transmission, improving acceleration over that of Powerflite equipped cars. Rear axle ratios up to 3.91 were in the standard carrier assembly, from 4.10 to 4.89 then used the Imperial assembly, and from 5.38 to 6.17 used a truck carrier assembly. Of course these higher ratios were listed strictly for racing, as Kiekhaefer needed them. The production tires were most unusual. Called Goodyear Blue Streak, they had a low cord angle to reduce tire growth and deflection at high speed. The low cord angle also reduced “morning sickness”, the flat spotting that caused a lumpy ride, standard in the 4-ply Nylon tires of the mid-50’s when they stood overnight. Goodyear used an obsolete tread pattern for these tires, and probably used modified molds, as the tire had a “wide oval” cross section when compared to standard tires, much like the difference between the 78 series and the 70 series tires today. 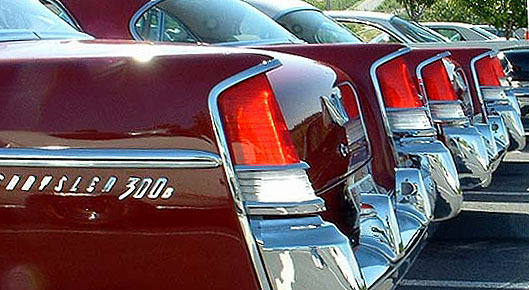 Basic changes common to all the 1956 cars made the C-300B a better car to drive than the 1955 C-300. 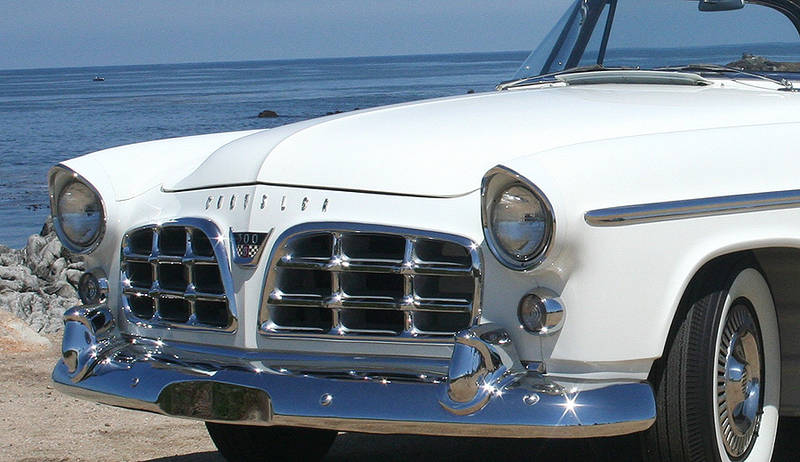 The 1955 cars were marginal on starting torque for hot starts; the 1956 12 volt ignition system eliminated this problem. The 1955 cars used the same reliable 12 inch Lockheed style brakes as previously, but switched to a small cowl-mounted power unit in place of the massive under-seat unit used in prior years. This inadequate booster assembly simply did not have enough power to lock up the non-servo action Lockheed style brake. 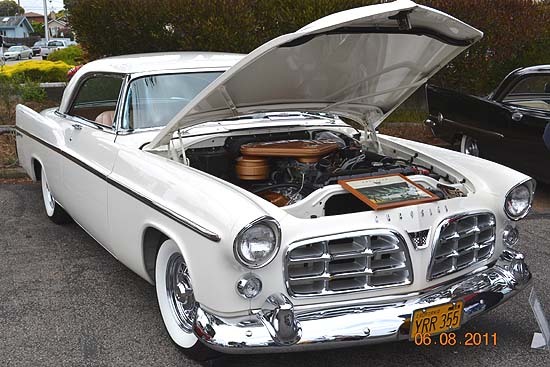 In 1956 a Chrysler designed servo type brake was installed, along with a larger cowl mounted power unit. This combination permitted a low pedal position with plenty of power to lock the wheels. Unfortunately, these brakes tended to squeal unless everything was perfect, causing a lot of customer complaints. 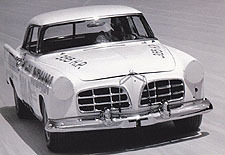 The 300B was the fastest stock car in 1956, turning 139.373 MPH on the sand at Daytona. This record stood among 300’s until 1960. The acceleration of the 300B was also exceptional, with Hot Rod magazine reporting a 0-60 time of 9.0 seconds, 0-80 in 15.1 seconds and ¼ mile in 17.0 seconds, 84.1 MPH for “America’s Hottest Stock Car”. Their test car had 3.54 gear and Powerflite. Very excellent fuel economy was also noted, especially for such a large car (test weight 4440 lbs.). Normal city driving averaged 16.8 MPG and the overall average was 13.3 MPG, including the strip testing. The 300B was certainly one of the best 300’s. Many 300 enthusiasts believe it was the pinnacle of the big, brutish, powerful cars and all following 300’s were somewhat more compromising. This we cannot say, but it was four years before the 300B was eclipsed as the fastest 300, an no succeeding 300 ever matched its racing record. (*) Ted Beebe has offered his services to the club as a consultant on 1955 and 1956 300 problems and questions. Ted was closely associated with the Chrysler 300 program during those years.